​During this workshop we will look at objects from a birds eye view and translate the images into a semi abstract artwork. When images are viewed from this unusual perspective forms tend to flatten out and their abstract shapes take precedence of recognisable objects. This is a helpful starting point for creating interesting shapes in relationship to one another to one another Please bring a printout of a photograph you have taken or a drawing you have taken from a birds eye perspective. This will be the initial starting point for your print. The drypoint mark has a unique quality giving immediate and raw impact to sketched lines. You will be shown how to build up your drypoint paper plate creating line and tone, to add depth and how to ink and wipe the plate to show subtle variations. Chine colle will be used to add colour and be printed along with the drypoint plate. We will start the day by loosening up with some charcoal sketches around Westbury Art Centre. We will then develop our chosen charcoal sketches to make our plates using carborundum powder(silicone carbide crystals). plates. Even if used very sparingly you will be surprised at the amount of ink that is held creating rich velvety tones in your print. You will be shown how to build up your plate using epoxy glue and carborundum to create rich shapes and line. Participants will then be shown how to ink and wipe the carborundum plate to bring out the rich characteristics of this medium. This workshop designed to marry up the drawn mark with printmaking. Explore the beautiful line. Hard or soft, sharp, fuzzy, thin or fat. We will start the day loosening up with some sketching around Westbury Farm. These sketches will form the basis for printmaking. The drypoint mark has a unique quality giving immediate and raw impact to sketched lines. 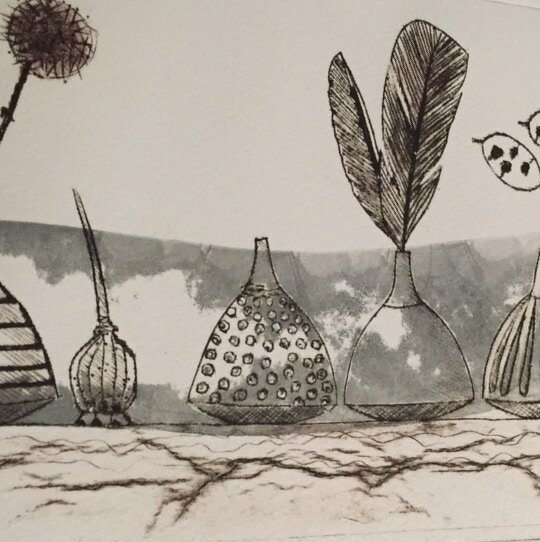 You will be shown how to build up your drypoint paper plate creating line and tone to add depth and how to ink and wipe the plate to show subtle variations. Translucent colour can then be added directly onto the plate.